I went to the woods because I wished to live deliberately to front only the essential facts of life, and see if I could not learn what it had to teach, and not, when I came to die, discover that I had not lived. For the past several weeks I have been feeling a pull to slow down and simplify. Without really being conscious of it I have been clearing away clutter on my desk and in my home. I have been completing projects and closing doors all in preparation to bring myself to a halt. I am heading into stillness where my real life exists, where my true self awaits and I feel like a little kid waiting for Christmas morning to arrive. I am so excited! 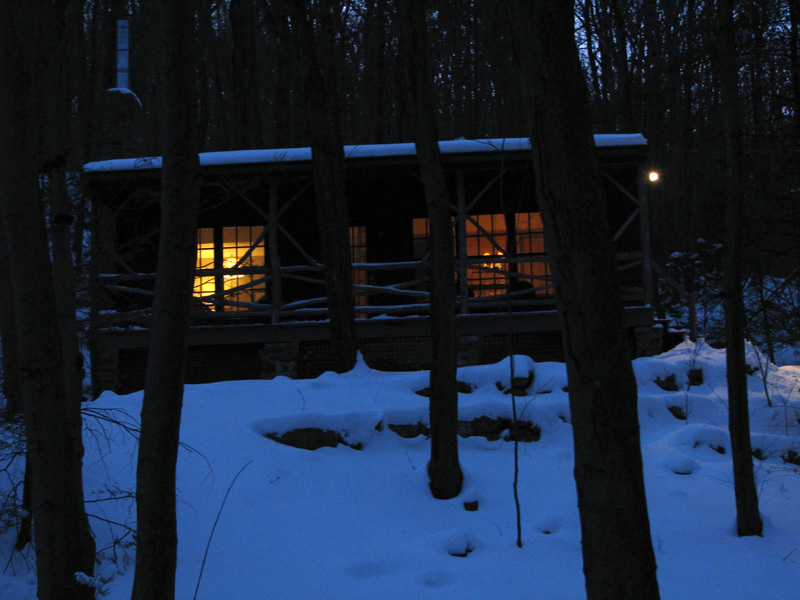 Tomorrow my family and I head to a small cabin in the woods of Pennsylvania (see pic) where we will retreat for three days of nothingness. It is only three days, which seems almost silly compared to the year Thoreau spent on Walden Pond, but three days is three days and is a whole lot more space than any of us are used to in our busy lives. So the four us (husband and girls, 18 and 20) have agreed to slow down, give each to other space, and cease the senseless moving and talking that habitually drains us precious energy and creativity. We will keep silent for a block of four hours each day (my idea, not theirs) in order to physically settle and mentally rest. That means no talking and no technology. During our non-silent times we will walk in the woods, prepare meals, talk about our intentions for 2014 and simply enjoy being with each other. I know that this may sound dreamy and even sort of ridiculously optimistic but the truth is that when you are given the space to be still and silent a settling takes place deep inside. You become clear and calm. You become more patient with others. A sense of peace and ease comes over you in a way that you can be in close quarters with others while not feeling cramped and crowded. You don’t need to escape to a cabin in the woods to be still and silent, though it does help to jump start the process every once in awhile. I have friends who have found ways to steal away a couple of hours or a day of silence in their homes for a mini-retreat every month. For me, setting aside an hour or two per week, turning off the wi-fi and settling into my journal or a book can help to reset my frazzled system. However you find your way to stillness and silence in 2014 is a victory and everyone around you will win because of it. So now as I head into the woods I bid you all a Happy New Year!